With a growing body of data suggesting a link between noise and adverse mental and physical health and with noise pollution becoming even more pervasive, especially from the rapid increase in air travel and highway traffic, individuals worldwide are forging alliances to combat this hazardous pollutant. Especially active are the anti-aircraft noise groups. In the United States, the federal government has limited its responsibilities with respect to noise control after an initial interest in the 1970s when legislation was passed promising to protect the American people against the harmful effects of noise. These past years anti-noise activists in the United States have been working arduously to urge the federal government to once again take an active role in abating and controlling noise. They have also been enlisting more citizens to their cause as they educate them to the hazards of noise. Carboplatin, a second-generation antineoplastic drug, is much less ototoxic than cisplatin in humans and many laboratory animals. However, when a moderate dose of carboplatin is administered to chinchillas, it can selectively destroy inner hair cells (IHCs) and type-I ganglion neurons without damaging the outer hair cells (OHCs). One of the earliest signs of injury from carboplatin is damage to type I, spiral ganglion neurons. Selective destruction of IHCs has no effect on the cochlear microphonic (CM) potential and distortion product otoacoustic emissions (DPOAEs). However, very high doses of carboplatin can destroy both OHCs and IHCs resulting in a decline in CM and DPOAE amplitude. In cases where carboplatin partially destroys the IHCs, the auditory nerve fibers that contact the residual IHCs have normal thresholds and tuning, but their spontaneous and driven discharge rates are reduced. These results suggest that OHCs are responsible for the sharp tuning and exquisite sensitivity of the cochlea. IHC loss leads to a reduction in neural input (i.e., sensory deprivation) to the central auditory system. Surprisingly, although the neural input to the central auditory system is reduced, evoked response amplitudes recorded from the auditory cortex are often enhanced. These results indicate that when the neural input to the central auditory brain is reduced, the central auditory system compensates for the reduced input by increasing its gain. Auditory warnings are used throughout industry, transport, and the medical world. Despite the fact that auditory warnings frequently have to compete with intense and complex noise backgrounds, their use is widespread. 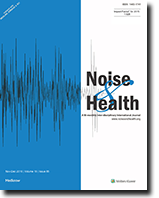 This article reviews research and practice in the area of auditory warning design and implementation with particular emphasis on noisy environments. Auditory and visual modalities as warning senses are compared, and ergonomic methods of producing warnings which are acoustically tailored to their environments are reviewed. Developments in design approaches are reviewed with examples of both traditional types of warnings and digital, contemporary warning styles. Other issues such as false alarms and the minimisation of warning numbers are briefly considered. There have been several recent reports on the potential risk to hearing from various types of social noise exposure. However, there are few population-based data to substantiate a case for concern. During the last 10-20 years use of personal cassette players (PCPs) has become very much more prevalent, and sound levels in public nightclubs and discotheques are reported to have increased. This study investigated the prevalence and types of significant social noise exposure in a representative population sample of 356 18-25 year olds in Nottingham. Subjects were interviewed in detail about all types of lifetime noise exposure. 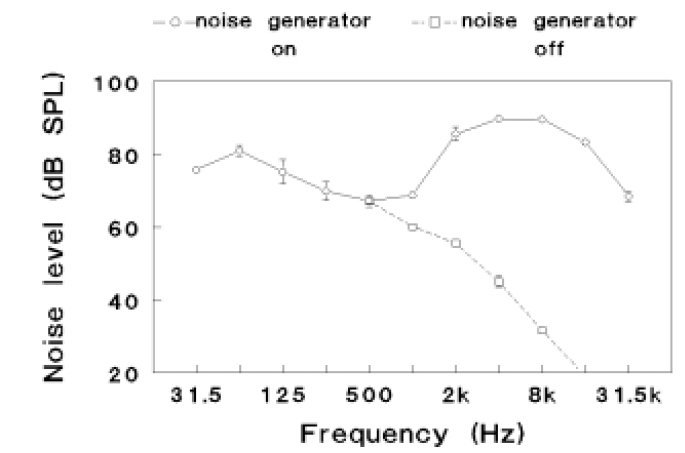 Noise measurements were also made for both nightclubs and PCPs. 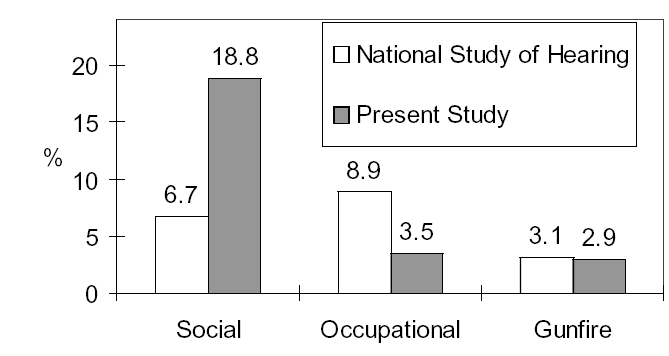 In the present sample, 18.8% of young adults had been exposed to significant noise from social activities, compared with 3.5% from occupational noise and 2.9% from gunfire noise. This indicates that social noise exposure has tripled since the early 1980s in the UK. Most of the present day exposure, measured in terms of sound energy, comes from nightclubs rather than PCPs. Moreover, 66% of subjects attending nightclubs or rock concerts reported temporary effects on their hearing or tinnitus. As will be reported in a later publication, any persistent effect of significant noise exposure on 18-25 year olds is difficult to show, however these data suggest that further work is indicated to study the possibility of sub-clinical damage, and also to consider the implications for employees of nightclubs. Four groups of rats (n=8 per group) were exposed to either 3000 ppm trichloroethylene (TCE) alone or to 95 dB SPL noise alone or to the combination of TCE and noise or to control conditions. Exposure was carried out 18 hours/day, 5 days/week for 3 weeks. 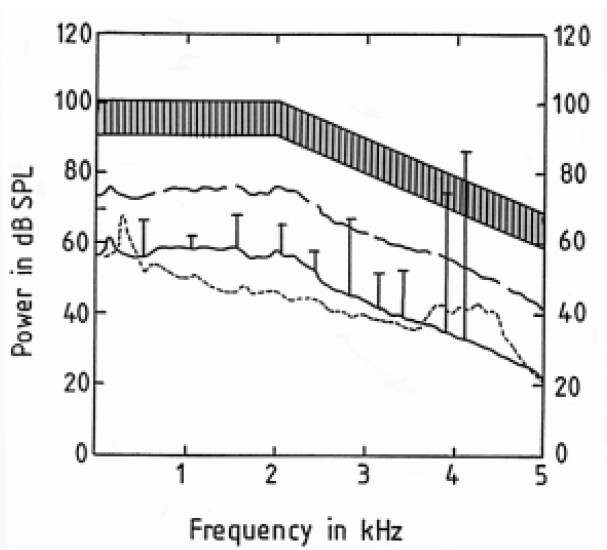 Exposure to TCE alone resulted in hearing loss at 4, 8, 16 and 20 kHz, but not at 24 and 32 kHz. Hearing loss due to exposure to noise alone occurred at frequencies of 8, 16 and 20 kHz. In general, combined exposure to TCE and noise resulted in larger auditory threshold changes than that produced by either TCE alone or noise alone when measured 1 and 2 weeks after the completion of exposure. For frequencies of 8, 16 and 20 kHz, hearing loss due to combined TCE-noise exposure was not larger than the algebraic sum of hearing loss due to exposure to TCE or noise alone. However, at a frequency of 4 kHz, hearing loss due to combined exposure was significantly larger than that produced by TCE exposure alone or noise alone, which itself had no effect at this frequency. These results suggest evidence of an interaction of combined exposure to TCE and noise at the lower edge of the range of frequencies affected. During the last 30 years several hearing disability and handicap questionnaires have been designed and used for clinical purposes. The present study includes a review of the most frequently used scales. The aim of the present study was to evaluate the reliability and validity of the Hearing Disability and Handicap Scale (HDHS), which is a shortened and modified version of the Hearing Measurement Scale. Correlations between the Hearing Handicap and Support Scale, the Communication Strategy Scale from the Communication Profile of the Hearing Impaired, pure tone audiometry and speech recognition scores in noise were analysed. Data from 168 men with noise induced hearing loss of different degrees was obtained. Also a test-retest was conducted. The disability section of the HDHS seemed accurate but offered no improvement of prediction compared to previous scales. Even though the reliability of the handicap section was sufficient, its validity and clinical use is discussed and suggestions about improvements given. Since standardised scales are necessary if results are to be compared worldwide, guidelines regarding the clinical use and benefit of hearing disability and handicap scales are required.